Happy Thursday - layout day. 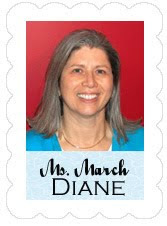 It's Diane, your Guest Designer and today I have a scrapbook layout to share with you. My personal scrapbook style is very simple, so it was a challenge to come up with something that would show off the capabilities of my Cricut a little bit more. 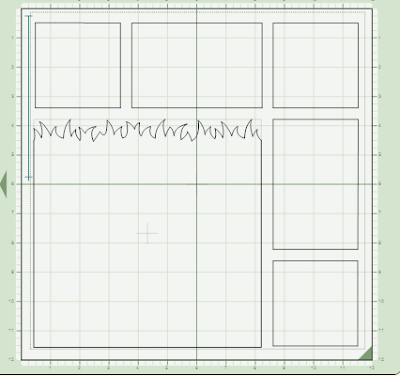 I did use Design Studio to create the plan for the layout and to cut the pieces. You can make a very similar layout without using Design Studio - I will explain where there are differences. If you don't have the full version of Design Studio so that you can cut the pieces, you can still use the program to help you figure out all of the cuts you need, determine the proper sizes and try virtual variations of your layout. This will save you a lot of time and paper. 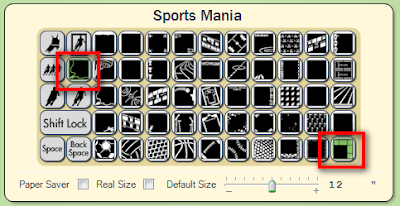 You may be surprised to find out that the base cuts for this layout come from the Sports Mania cartridge. Don't worry if you don't have it - there are some simple workarounds for the pieces I used. You will need the A Child's Year cartridge - one of my all time favorites! (If you'd like to see some of the many ways I have used ACY this LINK will take you to oldest page of the posts for A Child's Year on my blog - click on "newer posts" at the bottom of each page to work your way forward). I started with this element. I am not entirely sure what it is and there is no keyword assigned to help me out! I thought it made a great overlay for photos with a nice area left to decorate. If you try to cut it at "fit to page" on the Expression, you will get a cut that is a bit over 11 inches square. 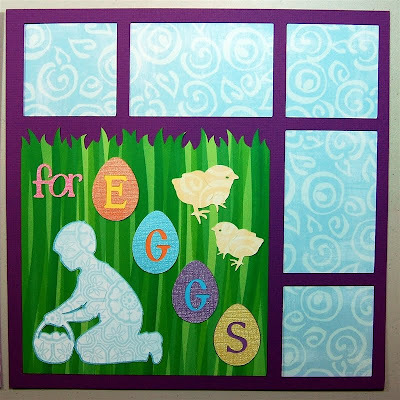 In Design Studio, you can fill the mat with the 12 x 12 image and the "windows" will cut in the full 12 x 12 page making a frame. 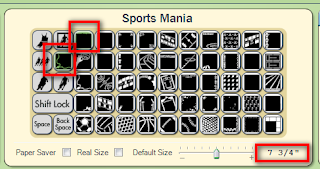 The grass is also on the Sports Mania cartridge - sized at 7 3/4 inches it fits the solid area nicely. If you don't have this cartridge or only have the baby bug or Create, you can cut a 7 3/4 inch square and punch or hand cut the grass edge. If you don't have the Expression or the Sports Mania cartridge, you can use the image as a placement guide starting with a solid sheet of cardstock, then cutting photos at 2 7/8 inches square or 2 7/8 x 4 1/2 inches and spacing them in the same pattern instead of using the page as an overlay. 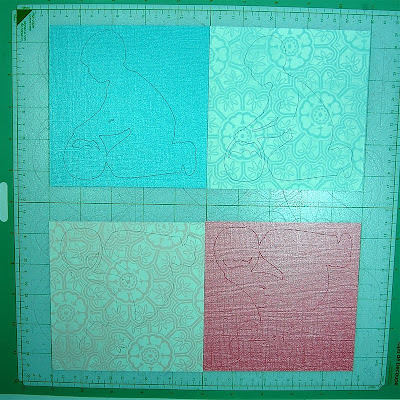 The Boy and Girl images are cut at 4 1/2 inches, regular and shadow. The Girl image is flipped (you can turn your paper over if you don't have the flip feature). The large chick is cut at 1 7/8 inches, the smaller chick is cut at 1 1/2 inches and flipped (once again , turn the paper over if you have no flip). The journal egg is cut at 3 3/4 inches. The "S" in the word "Searching" is cut at 2 3/4 inches and the rest of the letters are cut at 1 1/2 inches. If you do not use Design Studio and weld the letters you can overlap them to create a similar look. The "for" is cut at one inch and welded. 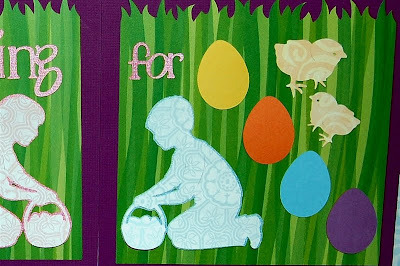 The smaller eggs are cut at two inches - there are extra eggs that I hid using "hide selected contour" and there is a highlight cut that I also eliminated with hide selected contour. 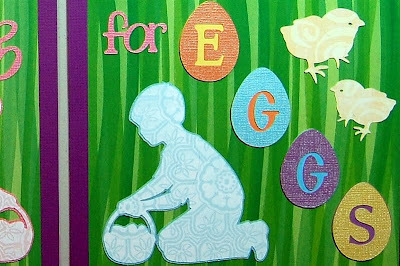 The letters are cut into the eggs and they are 1 1/4 inches (you can just cut them and layer on top of the eggs if you are not using Design Studio. The .cut file I used to cut the pieces for the layout is available on my blog - here is a LINK to the post. I like to create files even when I don't do much to alter the images - it certainly saves time if I want to go back and duplicate a project! There are two "reference pages" in the file that show how I worked out the sizing and layout of the elements. Nothing is actually cut from these pages - I have separated all of the elements onto various mats and labeled them with the paper sizes needed. This was the original plan for the orientation of the pages. I decided that it took too much focus from the photos that would be going in the openings so I flipped the frames to put the decorative section at the bottom of the page. 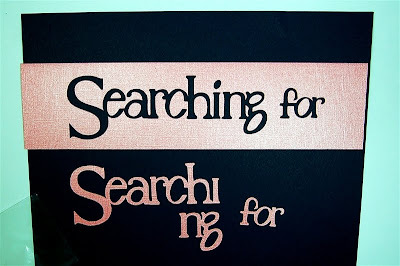 I set up the cut for the "Searching for" so that the offcut can be used for another project (searching for love, the princess who wears the glass slipper, the cure for breast cancer - all sort of possibilities!). Just be sure to save the tiny centers to reglue them when you use the cut - small ziplock bags are great for this!. If you are using the Expression you can load your mat from both directions and save time by putting the paper on for two pages at a time. Pay attention to the direction of loading so that you put the paper in the right places! 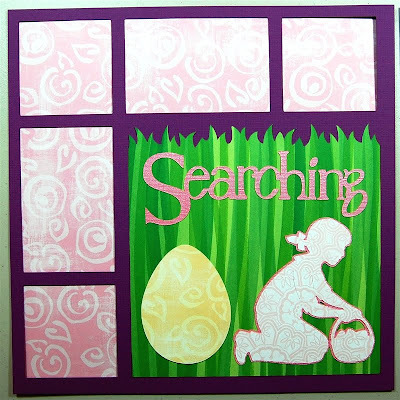 I used more of the gemstone Core'dinations cardstock for the words, eggs and shadows on the layout. I think it is so pretty and festive and it cuts beautifully. 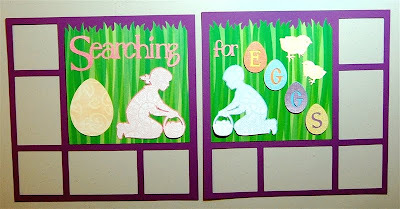 The first time I cut the eggs I did have some trouble with the cardstock shifting. This can happen when you use smaller pieces if your mat is not super sticky and the cardstock has a slippery finish. For the second attempt I added a bit of masking tape and "babysat" the machine while it was cutting to be sure everything stayed put. 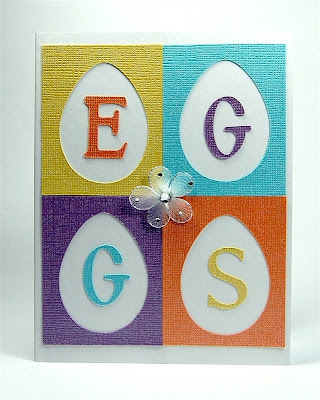 I decided to cut a second set of eggs and flip them over to highlight the letters cut into the gemstone side of the first set. The back of the cardstock has nice vibrant colors and no sheen. I went back and added these extra eggs to the file. Here is a close view of the layered eggs. 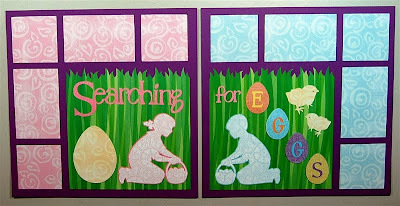 I used the "cascade" method of placing each base color next in line after the egg where it was the top layer. 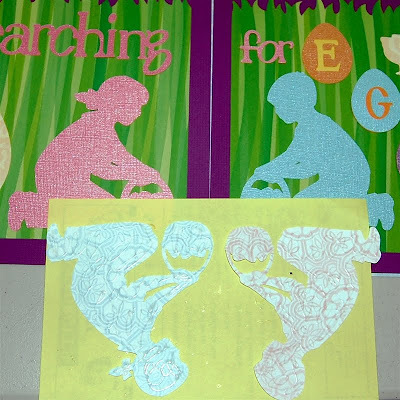 The little boy and girl shadows are cut with the gemstone cardstock. The top layers are from a lovely K & Company paper stack and are actually two sides of the same sheet. (In this photo I was waiting for the adhesive to turn clear to adhere the layers). The green "grass" paper is some old Creative Memories paper from the "Shades of Green" pack - unfortunately this is no longer available. There are other papers available that will give a similar look if you search for them. ...and the right side. The paper behind the opening is just "filler" - these are for your photos. (I debated about posting some family photos in the layout but decided against it). 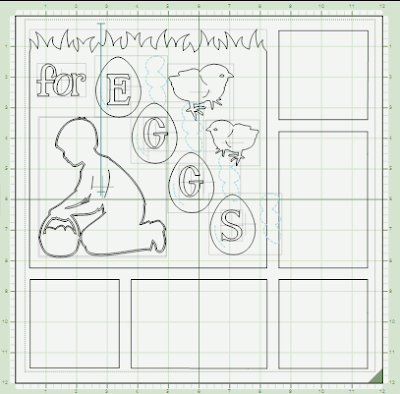 The large egg beside the little girl is for journaling. 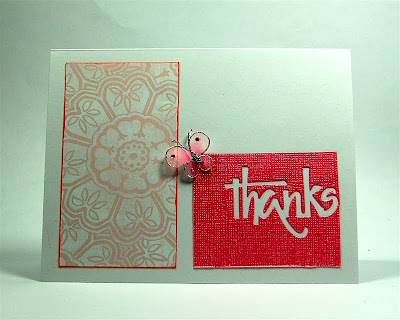 I was happy to see that many of you enjoyed the "leftover cards" - I find it very relaxing to make these. It also makes me feel "green" when I can avoid wasting all of the little bits and pieces. 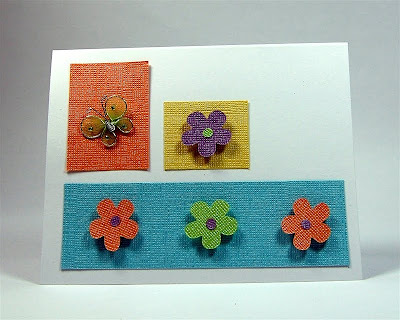 Here is another batch of "leftover cards. 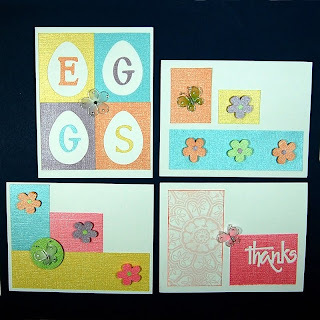 I think my favorite is the "Eggs" card! 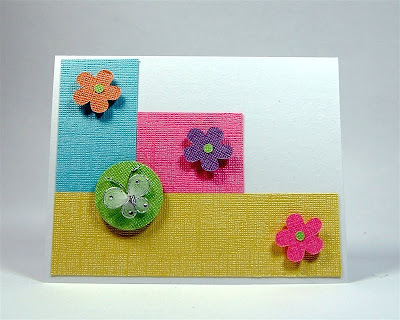 Another color blocking card with flowers and a butterfly embellishment from Creative Charms. Remember the "thanks" card from yesterday? Don't throw away the negative image! The week has been flying by - I'll be back one last time tomorrow for "Fancy Card Friday."